It will become very clear that this particular location, where the Meridian Stone is to be found, is the spot from which the major structures of Washington DC were laid out. This can only be because it was considered to be the most important place in Washington DC, even though there isn't actually anything much there to see. But we do have a clue because if we take a line across the widest part of the Ellipse, to the inside of the path that runs around it, that line will measure 366 Megalithic Yards. Now we can begin to show why this location is so important. It makes connections in Megalithic units to so many other important places in Washington DC. The most important of these initially was to the Capitol Building, planned right at the outset of Washington DC but not actually completed until 1863 (and much altered since). 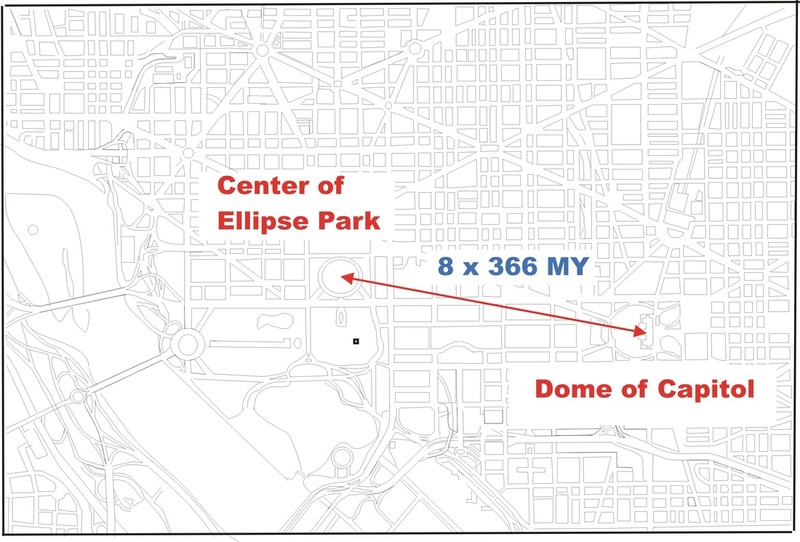 The distance from the center of Ellipse Park to a position under the dome of the Capitol is 8 X 366 Megalithic Yards, or 8 seconds of arc of the Earth's polar circumference. There are plenty more distances that run from the Ellipse that can be measured in Megalithic Second units but some of the most surprising actually highlight the Ellipse as being so important. These run from the Ellipse centre to a series of important intersections. All are measurable in units of 366 Megalithic Yards. When they are placed on the street map of Washington DC, this is what we get. What we see is a giant and elaborate arrow, quite definitely and deliberately pointing to the very centre of the Ellipse. Each and every line is divisible into units of 366 Megalithic Yards (1 second of the Earth's polar circumference). Could this happen by chance? Utterly impossible. It was quite clearly intended to be this way, but of course you can't see the arrow unless you know what you are looking for. Even if we allow for the fact that 'someone' knew about Megalithic measures and geometry when Washington DC was planned, what are the chances that 'someone' still knows? As it turns out the chances are very good, in fact it's certain they do. The Pentagon, which wasn't planned or built until the time of the Second World War, also connects in Megalithic units to the Ellipse center and to the dome of the Capitol. 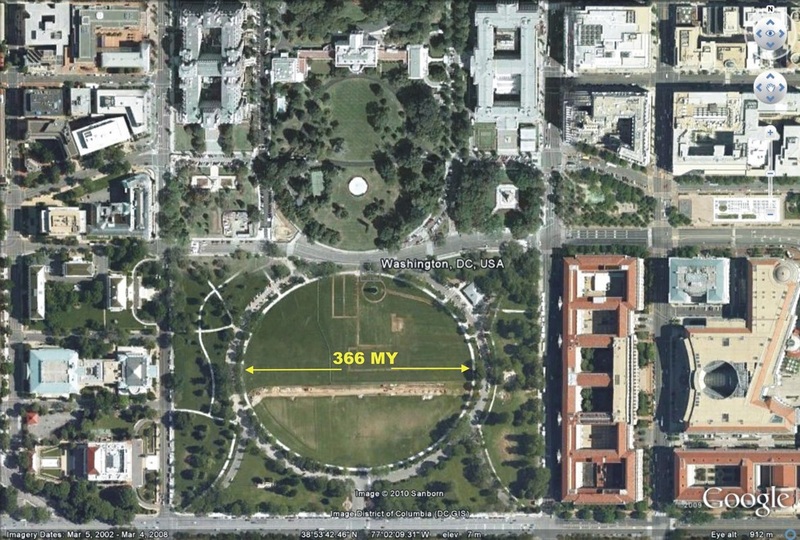 The Washington DC Triangle, joining the Ellipse center, the Capitol and the Pentagon in units of 366 Megalithic Yards. Around all sides of the triangle is 33 X 366 Megalithic Yards or 33 seconds of arc of the polar circumference of the Earth.